I love salsa, especially peach salsa. With peaches at the height of their season right now, it is the perfect time to make peach salsa. The problem is that making the salsa is time consuming and fresh salsa will not last for weeks in the fridge. You have to preserve it some how. How do you do this? You can it! Last week I was invited to a lunch at Mimosa Grill in Charlotte, put on by Ball. As you can see the lunch was delicious. It included a South Carolina Shrimp Salad, Fried Green Tomato Sliders, Roasted Springer Mountain Chicken Breast, a Heirloom Tomato Trio, Carolina Mountain Cherry Cheesecake, and Georgia Peaches and Creme. Usually I only use mason jars to drink beverages out of, but at this lunch Chef Keith Snow demonstrated how to use the jars for their original purpose, canning! Keith was demonstrating how to use the Ball Home Canning Discovery Kit.The kit contains everything you need to can 3 pints of whatever you want. In my case 3 pints of peach salsa. There is a booklet in the kit that gives great instructions of how the canning process works. It was not very difficult at all to do. The green basket that the cans sit in eliminate any problems you might have with extracting the cans from the water. Ball’s website has loads of recipes and steps to show you exactly how the canning process works. After this experience I learned 2 things. I am no longer intimidated by the canning process, and if you are going to can salsa it is best to can a whole lot of it. Thank you for everyone who participated in the contest! Congratulations to Robin for being the lucky winner! Count me in! I’d love to try my hand at home canning! Now all thats missing is your recipe for peach salsa 🙂 I am into pineapple salsa for the time being – great with grilled fish! I would love to start canning! I have always been scared of canning too, but always wanted to try it!!! I would love one. I have been wanting to try for some time now. I’ve always wanted to learn how to can (I even bought 2 dozen Ball jars) but have always been scared to try. I’d be interested in that peach salsa recipe too! Always love reading your post and would love to try to can my own salsa! I love to garden and cook. We are going to have so many tomatoes soon we will never be able to use them all but I am totally intimidated by the idea of canning. I guess this would be a great way to get me going. By the way, where´s the recipe for the peach salsa, never tried it and am rather curious what it tastes like! 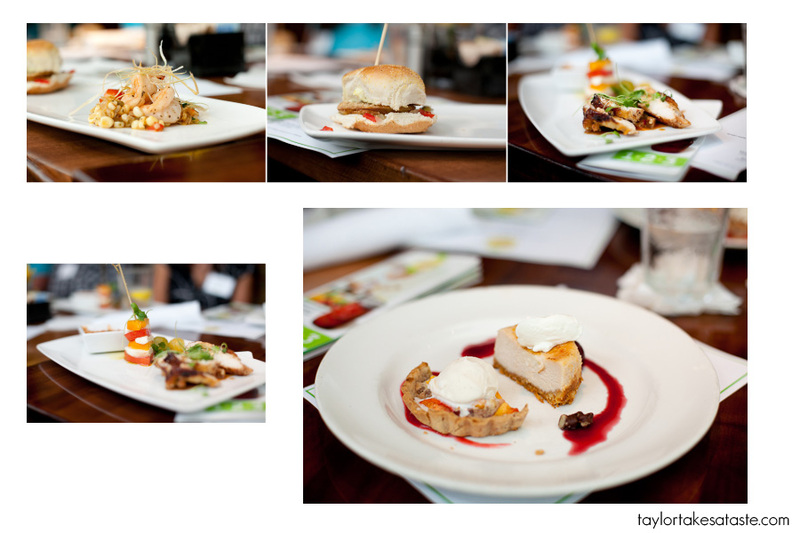 I want to win-but more importantly-I want to go to their next sponsored lunch! Canning would be fun to try! …come on, random number generator!! Ive been meaning to try my on canning for a while, peach salsa sounds like a perfect excuse to start! Taylor – I’ve heard that you have to cook salsa before canning it, otherwise the acidity isn’t there to make it safe for canning. Can you please post the recipe and processing instructions or link to them? I am scared of canning. Maybe if I win this I will get over my fear. I would love one of these kits! I make a roasted tomato salsa that is too die for and we’ve been trying to figure out how we can preserve it so we have some to eat this winter. I love the idea of peach salsa! Count me in for the giveaway. I have way too much squash coming out of our garden this year. Not quite sure what I’d can quite yet, but definitely interested in learning how. Thank you everyone who has entered so far, I am in Charleston currently and did not have the recipe with me when I wrote it, I will add the recipe when I return! Thanks again for all of your entries! Taylor, your salsa looks delicious! I would love to can some of my mango salsa-or the good old tomato-based salsa I’ve been making with fresh ingredients from the market lately. Maybe we could trade a jar then too. I’d love to learn how to can though so I can make those flavors last all winter long! Ohmigod, that canning rack is brilliant! I want it, count me in for the giveaway! Canning….one of those things I would love to do but never seem to have time. Someday….someday…..
I’ve been meaning to try my hand at canning for some time now. It’s taken a few years for me to get over the fear of messing it up, and I think this kit just might be the final push I need! I’ve always meant to learn about canning and would love to give it a try using this kit. Thanks for the inspiration! I’ve been planning on canning for the first time this year but I keep chickening out 😉 Would love to make this recipe, it looks great! I have lots of tomatoes from my garden ripening. Would love to can some! Canning is something I am determined to master this year, and this kit seems like a great start! Thank you for the giveaway! Canning is on my bucket list! Thanks for the givewaway. Canning is on my bucket list. Sorry if this is a duplicate post – it isn’t showing up and I got an error msg. Nice. I’d love to have that kit. Especially the rack thingy. I am intrigued by canning but beyond one batch of preserves I haven’t done much with it due to a lack of supplies and knowledge. I’ve always wanted to try canning but was afraid to go and buy all the stuff in case it didn’t work out. I love anything “Peach”!! I would love this! I usually don’t go for giveaways but I really would love to get more involved with canning. Thanks! What a handy way to start canning! My new garden is giving me lots of ideas, seems this would be a great place to start! Canning always reminds me of cooking with my grandma. I wish I would have learned more about it then, but I would love to be able to start and recreate some of her recipes! I love canning, it has been a summer ritual in my family since I can remember. I do some canning for my job too… but I use a combi oven with full steam to seal the jars. However, at home I do it the old fashioned way. 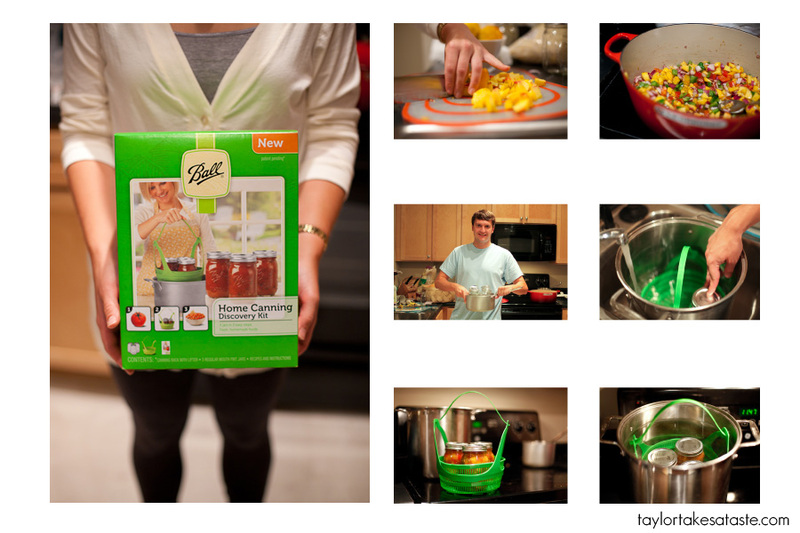 I have a few young interns in my kitchen that are starting to pick up canning… I’d love to win this for them! I just found your site, and it is gorgeous an wonderful. We have a huge garden. I don’t can — my husband cans! Right now he is canning peppers, yes pickled peppers. You can imagine how much fun it would be for me to win a canning kit to give him! Thanks for such wonderful eye candy! I watched my mom home canning old fashion way every autumn, getting ready for cold winter days of eastern Europe. Old fashion way doens’t appeal to me, but i would love to try this way. lovely, lovely photos! sounds like fun! I am SO glad I came over and read your blog! My parents canned every year and I wanted to start doing it myself.. I just might have to go out and BUY a kit!!! What a great site! Canning is wonderful and I’d love to win this kit. i’d love to can my own jam at home! and i’m trying to convince my mum to can tomatoes from their garden so i can eat them out of season! wonderful! I love canning. I canned my first pickles last year after my grandma’s recipe. Unfortunately, i didn’t trust that 8 cups of sugar could dissolve in 2 cups of vinegar and increased the vinegar, making the pickles much too sour. So this year I need to try again! A kit would be great since I have to bribe a friend with pickles to use her set. Enter me please! I’d love to try canning. I’ve never canned before. It seems so scary, but you make it look do-able. I would love to make jam at home. But I’m minus the cans to make them with. I think I might go and buy a kit! How fun! Canning is one of those tasks that it seems is most successful when passed down. As a city girl it’s always intimidated me, but I do plan to try it some day! Dont stop at peaches now, you will be hooked on canning! Im glad attending the event was inspiring to you! Beautiful photos too!! btw, random but you wouldnt happen to be related to the Mathis’s in Carthage, MS would you? I am so looking forward to taking the plunge and try canning this summer! You made it look so easy! I have a ton of zucchini and tomatoes I need to learn to can. My fear is that I am going to open it up to find I didn’t can it right (eww!!). I’ve also always been intimidated by canning. But I would love to replicate my grandma’s canned peaches! my first time visiting your blog — found my way here from foodgawker.com i’ve bookmarked you — great photos and writing. and i’ve always wanted to try canning but have been intimidated. Would love to try this – looks delicious! Wow, canning; a lost art. My mom used to do tons of it each year: fruit, tomatoes, jellies. I should go to Farmer’s Market and give canning a try. ooh..love the mason jars myself….love to own the kit and try some canning…. I’ve been meaning to get more canning supplies to take advance of peach season. I love your photos btw! I love canning and that green basket looks amazing! I can’t wait to give that a try! 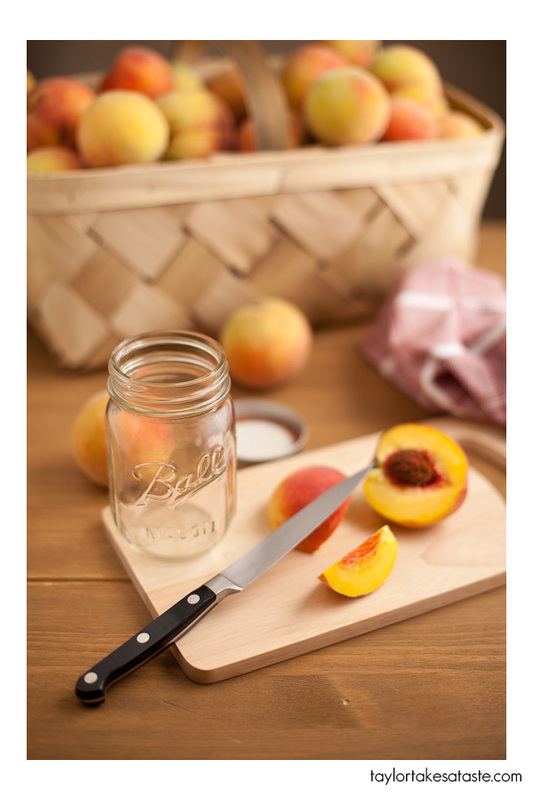 Peaches have been my stone fruit to experiment with this summer….I would love this kit!!!!!! what a neat idea! I’ll have to try it! New visitor to your site – the photography is gorgeous and I, too, am going to go on a canning adventure with some friends this weekend. Thanks so much for the giveaway! I have been trying to gather information about canning because it seems a bit confusing (and dangerous if you’re not sanitary). But this canning kit looks easy to use! Thanks for the info! I’d love to win! Sounds fantastic. I’ve been wanting to learn how to can for a long time. I don’t have enough time for a class but I could definitely handle a kit. Oh boy! I’ve been wanting to start canning for so long but haven’t known where to start! Winning this kit would be lovely! Nice post and what a great beginner’s kit! This looks amazing! I was just thinking the other day how I wanted to learn how to can and this really inspires me to give it a try. Looks great! I would love to learn to can. I’ve been wanting to try canning for awhile now… This new kit looks really cool! Wow, canning. My mother used to can and made her own wine. You can’t image what a lovely chardonnay style wine you can make with bananas and lemons! Growing up in Germany I saw my Oma and Mama always can and preserve. Bottles of raspberry syrup, canned fruit and veggies, preserved apple cider etc. And the creme de la creme – Rumtopf. Thanks for the giveaway offer. I *so* want to learn how to do this! We have a CSA this year in addition to our garden, and soon I will be swimming in tomatoes! You’ve given me hope that it’s not so impossible … thanks for offering the giveaway! I need this! We have a tree full of apricots that need to be put up–and this will be my first time trying to put up preserves! What a great kit! Love the peach salsa idea and would love to can some too! Thanks for the giveaway! I have always been irrationally terrified of canning. Perhaps a simple kit like this could set me on the right track. I’ve been wanting to try canning for a while now… Boston winters are so long, it would be great to have a taste of summer in the middle of a blizzard! Enter me, please! I’ve tried canning with mixed luck. One of my biggest complaints is that if I don’t make a full canning rack the jars fall over; I think the basket would fix that! And a jar lifter sure would be handy! I’m planning on canning for the first time this summer. Hopefully, tomatoes. I’ve been wanting to try my hand at canning! My old housemate used to be our resident canning person but she got married and moved away. The kit looks like a great way to start. I’ve always wanted to try canning, but the process is so foreign to me! I’m amazed at how easy it all looks! You’ve definitely given me the drive to try it! yes please. I have more strawberries than I know what to do with. Canning seems like the way to go. Yes, please! There were coupons in the Sunday paper a few weeks ago for the kit and additional jars…I’ve been thinking I should give this lost art a try! Hope I win! I’ve tried canning in the past with less than stellar results. I’d like to give it a shot again. I landed here by way of Foodgawker and I’ve enjoyed looking around your blog! I’d love to be able to can! Especially rhubarb in the spring!